In our last edition of the EYE Digest, we discussed lifestyle and over-the-counter/home remedies for counteracting dry eyes. A quick recap of these can be found below. To read the article in full, please click here: Dry Eye Syndrome, Part II. In today’s article we will talk about exciting advanced clinical procedures that we can use to combat dry eye. Many of these procedures have worked wonders for patients. We will also discuss prescription medications that can help with dry eyes. The idea behind plugging the punctum is to allow the tear film to sit on the eye for a longer period. You can think of this concept in a similar sense as plugging the drain of a sink. Doing so allows water to sit rather than be expelled to the sewer. Now one might wonder if tears will “overflow” and spill down the cheek if the drainage ducts are plugged. Since tears are evaporating at a rapid rate, which is the case in dry eye syndromes that require punctal plugs, for the most part this does not occur. So how does the punctal plug procedure work? Well first we start with a trial run. I will insert a temporary collagen plug into the puncta. This temporary plug will work for a few weeks and eventually will dissolve. The idea behind the trial run is to see if the plug provides needed relief to the patient and is not met with a hypersensitivity reaction. After the trial run, we have a few options for more permanent plugs. We can use plugs that last for a few months or plugs that can stay in for years. We will often do measurements to ensure that the plug is of the exact size so it does not fall out of the eye. With punctal plugs, patients tend to notice dry relief within a few days of instillation. The plugs are not cosmetically visible on the eyelids and generally have no associated discomfort. 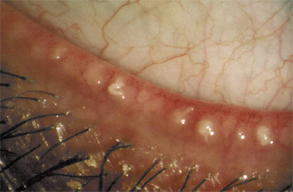 On both the top and bottom eyelids, there sit many little tiny glands that produce oil. 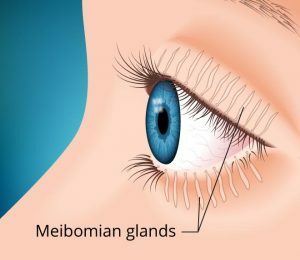 These glands are called Meibomian glands. If you remember from our last dry eye article, oil plays a vital role in holding the tear composition together and preventing tear break up. In many individuals, these oil glands can become clogged or capped, which leads to reduced oil in the tears and subsequent dry eyes. Clinically, we are able to express (open up) these glands. The primary way we do this is by mechanical expression. A device called a Mastrota paddle is used to create pressure and push oil out of the glands. This physical push opens up the gland and allows oil to flow free out of the top of the gland. In addition to mechanical expression, eye doctors also have access to medical technology that allows an even higher degree of gland expression. One such device is called Lipiflow. With this device, a sort of suction cup is placed over the eye and delivers a pulsating treatment that opens the oil glands and promotes outflow of oil. Now that we have covered in office procedures, let us talk about prescription medication for dry eyes. If you are an avid TV watcher, or even an occasional viewer, you probably have been exposed to an advertisement that tells you to ask your eye doctor about Restasis. So what is Restasis? Restasis, or cyclosporine ophthalmic emulsion 0.05%, is an immunosuppressant that was found to have positive effects on dry eyes. Specifically, cyclosporine works by lowering the activity of T cells and their immune functions – this in turn reduces inflammation. In certain cases of dry eye syndrome, it is thought that inflammation leads to a lack of tear production, thus cyclosporine reduces this inflammation and increases tear production. In addition to Restasis, another similar medication named Xiidra or liftegrast opthalmic suspension 5% has recently been released. Although not the same as Restasis, we can think of Xiidra in a similar vein, in that it acts on T lymphocytes and works on decreasing inflammation. In my practice, I have placed many patients on both Restasis and Xiidra. I have seen positive results from both medications especially when I incorporate them into a dry eye therapy plan that includes a variety of other remedies. An important factor to note when thinking about Restasis or Xiidra is that these are long term treatments for dry eye syndrome. It normally takes my patients weeks to months before a substantial benefit is noticed. Both of these medications are dosed twice a day in order to achieve the full effect of the medication. Ultimately, each of the clinical procedures and prescription medications I have described above work well if enacted with a proper diagnosis and proper course of action. If you believe you may benefit from an in office procedure or prescription medication, please do not hesitate to contact us and schedule an appointment!